Masters running can present certain challenges that runners didn’t face at age 20. Despite that fact, it’s common that runners can continue to remain healthy and improve as they age. Whether you’re a lifelong runner or someone who’s just starting out, here are some of the best exercises for masters runners to add to their routine. Masters man at ACXC 2018. 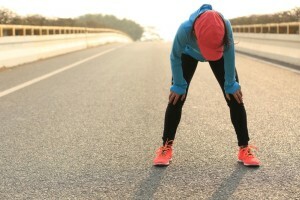 The Sports Medicine and Arthroscopy Review released a literature review on the biomechanic shifts that runners undergo as they age, and provided some helpful tips to keep people running and healthy as they get older. One of their tips for staying healthy was implementing a strength routine. Carla Robbins is an Alberta-based strength coach from Vital Strength and Physiology, applied exercise physiologist and ultrarunner. Robbins created a 10-exercise program complete with what she deems the most important strength exercises for runners as they age. This exercise develops lower body strength, along with working on trunk stability and range of motion in the shoulders. Push-ups develop trunk and upper body strength. Try to keep your back level and get your face as close as possible to the ground. Deadlifts are a safe and effective way to develop lower body hinge mechanics and strengthen while working on good spinal posture. Again, be sure to keep your back straight and your glutes engaged. This exercise is nice way to offload the back while working on upper body pulling strength and scapular control. You should feel like you’re trying to squeeze a pencil between your should blades. This exercise is also known as a reverse lunge. It helps develop unilateral lower body strength and teach how to control the spine in an unstable position. Be sure to not let your knee bend beyond your big toe. Have your lower knee kiss the ground. This exercise develops the ability to load unilaterally through the foot and ankle while working on deceleration mechanics and stability of your lower limbs. Fall off of the platform and land onto your foot. Try and stay as stable as possible while lifting your back leg as your front leg falls. This exercise will strength your hamstrings and glutes. Place both feet on top of a ball and drag them towards you, keeping your pelvis level through the movement. Runners, don’t forget your upper body. Upper body mobility for the spine maintains good range of motion. This is super crucial for the running gait, and not getting the rotation from the lower back instead of the upper. Lie on the ground keeping your back in line with you straight leg. Start with your knee at 90 degrees and the same-side arm reaching away from your body. Once you’ve held a stretch there, reach your arm across your body to stretch the other side.